Another month comes to an end. We have focused on Step 4, feeling our feelings, this month, a hard topic for many of us. We've learned to identify and honor our feelings, choose which ones to feed, transform them, own them, and cradle them. So just for fun, let’s end with a song. Here are the lyrics to “What a Feeling” from the movie Flashdance. No deep meaning here. Just enjoy. When I moved to the Northwest, my son had just turned four. I knew something was not right, but I didn’t have a word for it yet. After lots of diagnostic testing, I had a word. Autism. Suddenly I was in a new world, a world I did not want to be in. A world I didn’t know how to navigate. A world I only wanted to escape from. There were lots of people to meet that I never would have crossed paths with. Experts. Parents. Doctors. Teachers. Specialists. Support groups. I was flooded with way too much information. I couldn’t begin to sort it out. I was numb. No time for feelings. I had to function. I was alone with a son I loved who had a problem. I had to fix the problem. That is what I knew how to do and I did it very well. Fix problems. Find a solution. Make everything all right. Someone said I should talk to Sherry, a mom/expert. Sort of the mother superior for all the novitiate moms. I took James to her house. She was so friendly. I thought she was so happy because she knew how to make this all go away. She was going to share the secret cure with me. She had this great big smile on her face as she exclaimed, “I love autism!” Wow, I thought, will I ever love autism? I was pretty sure I wouldn’t. We sat at her kitchen table while James played with her son. She was so perky as she laid out the future, my future, and told me what I needed to do. I stared out the window, wanting to be anywhere but there, like the guy in the commercial for Southwest Airline when the narrator asks, “Want to get away?” At one point she was talking about another family. She sighed, shaking her head, and confided that they had not even grieved yet. Grief. Now there was a concept I had not thought of. She seemed to think that it was important. I filed that away for another day, another year, another decade. Feelings can be so scary. Grief, anger, shame, sadness. Sometimes they are too scary to even name. But acknowledging our feelings can help us accept them. Labeling them brings them into the light. Tara Brach describes the following example in her book Radical Acceptance. An elderly Buddhist teacher named Jacob continued to teach even though he had mid-stage Alzheimer’s. He sat down to teach a large group one time and suddenly couldn’t remember why he was there. He began to panic. His training kicked in and he started labeling out loud what was happening – afraid, confused, shaking, lost.... Gradually, he relaxed and he labeled that, too. Relaxed, safe, okay, calm. The students were moved to tears by this deep teaching. By simply labeling, he stayed grounded and didn’t get sucked into his agitation. Thich Nhat Hanh teaches us to cradle our feelings, all our feelings, like a baby. If you are agitated or overwhelmed by whatever you are feeling, you can label it like Jacob did. Then hold it gently in your arms and rock it like a baby. You can even rock your fear to sleep. (I just had this image of Rosemary, in Rosemary’s Baby, cradling her demon-spawn child. Love is that powerful.) Cradling our feelings helps us contain them, tolerate them, soothe them, embrace them. Eventually, I did stop fighting my grief and fear and sadness. I yielded. And the pain was not so great. I learned that living with the fear of feelings was much, much worse that living with the feelings themselves. In a classic Buddhist story, a mother, crazed with grief over her son who just died, begs Buddha to use his power to bring her child back to life. Buddha promises her that he will grant her wish if she can bring him a mustard seed from a home in which no one has ever died. She frantically goes from door to door, but everyone tells her a story of loss. She cannot find even one home that has not been touched by death. By the time she returns to Buddha, she understands the truth of sorrow and life. She asks Buddha to help her bury her son and becomes his disciple. When I feel a distressing feeling now, I rock it tenderly and sing it lullabies. I think about all the other people in the world who feel this feeling. I know that whatever I feel has been felt before, and is being felt this very moment, by millions of people. I reach out to them, filled with compassion for us all. Our hearts are one. And in that oneness I find peace. I sat in the subdued lighting of the ultrasound room. The technician glided the wand over my daughter’s growing belly. Too soon, too soon. Too young to have a baby. And yet, there it was. Checking, checking. Heart, brain, spine, abdomen, arms and legs, fingers and toes. Everything was there. Surreal. And finally, the announcement we had been waiting for. “It’s a boy.” I started crying. Laughing and crying. Was I sad or happy? I have no idea. All I know was that my heart was full and overflowing. How am I supposed to make sense of this? My mind tells me stories, stories of judgment and fear, embarrassment and worry. Oh, but my heart. My heart tells me stories of love and forgiveness, acceptance and anticipation, willingness and wonder, trust and faith. Chogyam Trungpa teaches that joy comes from the gentle heart of sadness. When we can break through the hardness of absolutes and move through our fear of uncertainty, we find ourselves in the sea of sadness. All the suffering of the world is there. We might want to escape. Fear might lure us back to the “safety” of our hard defenses. But if we can find the courage to stay, to yield, we can sink into the softness of our tender, open heart. With our heart thus exposed and vulnerable, we we are connected to the deep heart of all hearts. There we find freedom. We can soar with eagles in the vast blue sky. I knew someone once who had a cockatoo named Hank (or maybe it was Frank). When Hank wasn’t sitting on my friend’s shoulder nibbling his hair, he was on his perch, shifting from one foot to the other, bobbing his head, and squawking. One day while I was visiting, my friend casually called to Hank on his perch, “Hey, Hank, be an eagle!” Hank stopped mid-shift, mid-bob, and froze. I chuckled, thinking that Hank was doing a poor imitation of an eagle. But then I stopped, mid-chuckle. Something was happening. Hank’s eyes got darker, with little flames licking the blackness. He locked his smoldering gaze on me. I couldn’t move. He drew himself up straight. He was much bigger and taller than I had noticed. His talons were longer and sharper. His crest was fully erect. And then in slow motion he unfurled his wings until they seemed to stretch across the room. A more fierce raptor never graced any United States insignia. Hank held his pose. My heart was pounding. The room was silent. And then he slowly folded his wings and shrank back into his goofy cockatoo self. It was still a few moments before I could move. I turned to my friend, who was lounging in his easy chair watching me, smiling. “You make me so ...!” Sound familiar? All of us have probably said this at one time or another. Probably more than once. Possibly many times. And it must seem that way. Someone does something and afterwards we feel pleased or upset. Our minds attach a causal connection between the act and our feelings. But is that true? We learned earlier this month that our feelings are based on our own thoughts and beliefs. When someone does something and then we feel a certain way about it, we are attributing a causal link that overlooks the role of our thoughts. It is our thoughts about the act that give rise to our feelings, not the act itself. We can shift from being feeling victims to feeling victors by a simple shift in language. Instead of saying “You make me so...,” say “I feel [name feeling].” Own it. Your feeling is your responsibility, not someone else’s. Consider the difference between “You make me so angry,” and “I feel angry.” Or “You make me so happy,” and “I feel happy.” How do you feel (!) if you say one or the other? When I say “You make me feel so...,” I feel powerless and anxious. I want you to behave a certain way so that I will feel a certain way. My emotional well-being becomes your responsibility and I become dependent on you. If I’m feeling happy, good for you. But if I’m not feeling happy, it must be your fault. Chances are I won’t feel happy all the time, so I’m setting you up to fail. And even if I feel happy, there is always an underlying anxiety because I know I can’t control your behavior. It will only be a matter of time before you do something to “cause” a distressing feeling. But if I say “I feel...,” I feel grounded and centered, even if the feeling itself is distressing. Owning my feeling gives me the opportunity to examine my underlying thoughts and beliefs and to adjust them if appropriate. I recognize my power to transform my feelings. Even distressing feelings are less scary because I have tools for dealing with them. The bonus to owning our own feelings is that we also recognize that we are not responsible for someone else’s feelings. What a relief! She was on the other side of a room filled with kids, mostly girls, at the orphanage in China. She was already grown, a teenager, not a child. She glanced at me and smiled. I fell in love. A year and a half later, with adoption plans moving forward, I wrote to ask her if she wanted an English name, and if so, what name appealed to her. She replied that in China, a parent gives her child a name that represents a wish or hope for her child. She wanted me to choose her name, to state my wish for her. I thought about all that had transpired since I met her. I thought about her courage to leave everything behind, everything that was familiar to her, and to begin her life anew, where nothing would be familiar. It was like being born again. A new life full of hope and promise. I named her Lily, the flower of Easter, in hope that her new life would bring her joy and fulfillment, the fulfillment of life’s promise. As we approach Easter Sunday, I hope that, whatever our faith beliefs, we can all find renewed hope, an opportunity to start afresh, excitement about possibilities, a release of all that holds us back or holds us down. Every day is a new day. Every day is Easter. As we continue our discussion this month on Step 4, Feeling Our Feelings, let’s try to put together some of the concepts we have talked about so far. First, we recognized the importance of identifying and acknowledging our feelings (Nice to Meet You, Mad/Sad/Glad Game). Then we looked at the power we have to choose which feelings to feed (Which Wolf are You going to Feed? ), and we identified ways we feed feelings, especially feelings that only serve to cause us suffering because they close our hearts and separate us from other people (Feeding the Wolf). Our feelings are based on our thoughts and beliefs. Consider how the same event can trigger different feelings in different people. (Think about most any election, for example.) Unlike feelings, we can choose our beliefs. If we can change our thoughts or beliefs, we can change our feelings. The Dalai Lama uses this method of cognitive intervention to replace anxiety-generating thoughts with well-reasoned positive thoughts. I like it because it honors our feelings rather than denying them or repressing them. Cognitive intervention (which also goes by other names like cognitive behavior therapy or reactive emotive behavior therapy), basically takes us through several steps based on some version of the following questions. 1. Triggering event – What happened that caused an emotional reaction? 2. Feelings – What feelings am I experiencing? How intense are they? 3. Beliefs – What went through my mind? What beliefs do I have about this event? 4. Evaluating beliefs – Do I know for a fact that these beliefs are true? Am I playing head games (amplifying, guessing, identifying, forecasting, blaming, justifying)? 5. Alternative beliefs – Is it possible that other or opposite beliefs are true? Is there another way of seeing this? 6. Feelings – What am I feeling now that I’ve considered other beliefs? 1. Let’s say you are walking down the street and you pass someone you know. You smile and nod, but the person doesn’t acknowledge you. This is the triggering event. 2. You might feel hurt or annoyed or confused. 3. Look underneath the feelings to the thoughts or beliefs. You might think that the person is upset with you, or that the person is a snob. You might think you have done something wrong, although you can’t think what it might be. Or that you are not good enough in some way. Underneath each feeling that you identify, you will find some thought or belief. 4. Ask yourself if you know for sure that these beliefs are true. Go through each belief. Do you know for a fact that the person is upset with you? Or that you are not worthy of a greeting? 5. Consider other possibilities. Is it possible that the sun was in the person’s eyes? Perhaps the person was deep in thought and not aware of the surrounding people. Is it possible that you did nothing wrong to cause this person to ignore you? Perhaps the person was having a really bad day and just not feeling friendly. 6. These thoughts generate very different feelings, even compassion. The event didn’t change, but your feelings are different now because you questioned the underlying beliefs. You have transformed your feelings from ones that increase your suffering and separation into feelings that open your heart and soothe your distress. I have used this technique in many circumstances. Sometimes, if a distressing feeling is particularly intense and recurring, I have to use it several times with the same event! Give it a try and let me know if it works for you. I’ve been asked by a fellow blogger to write something in response to the question “How do you provide value?” That is an interesting question to write about, because I think we are not the best judges of the value we provide. Most of the time we don’t know what value we have provided unless it is reflected back to us somehow. At my father’s memorial service, people I had never met came up to me and told me of some way he had touched their lives, through teaching, or mentoring, or lending a hand, or encouraging them in some way. I wondered if he knew that he had such a profound impact on these lives. Perhaps he would have been surprised to hear what people said. I was reading a friend’s blog recently. She wrote about being called to the phone when she was in graduate school years ago because her mother was dying right then. There was no time to get to her side, so my friend went into a conference room and had one last tender and loving conversation with her mother on the phone. Later that day, someone she didn’t know very well came up to her and said that she had inadvertently overheard the conversation from a nearby room. This person offered words of condolence as best she could. My friend wrote that these words meant so much to her, and gave her comfort at a devastating time when she felt alone and far away from her family. Everything we do in our lives, every thought and word and action, has the potential to provide value to someone, to our community, to our environment, to the universal energy that connects us all. Everything matters. If we believe that, then the value we provide will be magnified, in ways we may never even know. In the last post, we talked about our power to choose which feelings to feed, those that isolate us from others by closing our hearts, or those that connect us to others by opening our hearts. So how do we “feed” our feelings? Amplifying. We amplify our negative feelings by magnifying them with extreme characterization. This always happens to me. No one ever listens to me. This is the worst thing that could happen. My life is ruined. You do that every time. It will never get better. Guessing. We pretend to know what other people will do or think. We assume the worst and trigger an emotional reaction to that assumption. My supervisor thinks I’m not doing a good job. People think I’m a bad mom. He’ll probably just say no. She won’t want to do that. Identifying. We interpret some event as being about us. Forecasting. We play the what if game, spinning out worst case scenarios and reacting to them. If this was an Olympic event, I would have a wall of gold medals. I can take most any event and turn it into my worst nightmare. Here is an example. I’m not making this up. Once I was driving down the street and someone looked poised to step off the curb. I slowed down and passed without incident. Then I started forecasting. Oh my gosh, what if she had stepped off the curb and I hit her? What if she was permanently disabled or died? What if she has children? What if I got sent to jail? What would happen to my kids? What if her family sued me and I lost everything? How would I ever live with the guilt of causing someone such terrible harm, even if it wasn’t my fault? What if it was my fault? What if I wasn’t paying attention and hit someone? Justifying. We feel righteous in our feelings, even if the feelings do not serve us. We become defenders of our own negative emotions. If this happened to you, you would feel like this, too. I have a right to feel this way. You don’t know what it’s like. I won’t let him do this to me. Do any of these sound familiar to you? If we can identify our negative habits, we can change them. I’ll write more soon about how we can do that. Which Wolf are You going to Feed? The last posts have been about acknowledging and honoring our feelings rather than denying them or repressing them. But some people have no problem identifying their feelings. On the contrary, as one commenter shared, their feelings are front and center, out of control, buffeting, raging, exhausting. How do we honor our feelings and at the same time not be at their mercy? I hope that as we focus on Step 4 this month, we can find a middle way, a way of modulating our feelings to support our emotional balance. We can choose not to feed feelings that create separation and hostility. Pema Chodron tells a story from The Search for a Nonviolent Future by Michael Nagler, about a Jewish couple, Michael and Julie Weisser, who lived in Lincoln, Nebraska. They began to get threatening phone calls from the Ku Klux Klan. The caller would threaten to kill them, destroy their property, and harm their friends. They must have felt afraid, and probably angry. The Weissers eventually figured out that the caller was Larry Trapp, the Grand Dragon of the Klan in that town. They knew that Larry was in a wheelchair and had a hard time getting around. During one venomous tirade, Michael spontaneously offered to give Larry a ride to the grocery store. Silence on the other end. Then Larry thanked them. They began to call him to offer whatever kind of help he needed. They brought him a home-cooked dinner. Finally, one day Larry took off his Nazi ring and severed his connection to the Klan. The Weissers understood that behind every act of cruelty, there is always fear. They chose to feed the wolf of forgiveness and compassion. When we feel a strong emotion based on fear – hatred, anger, vengeance – we can remind ourselves that it will pass quickly if we don’t nourish it. We can pause and choose wisely which wolf to feed. My son has autism. People with autism have difficulty with feelings. They don't pick up cues about what other people are feeling. They sometimes don't know what they are feeling themselves. When my son was a little boy, we would play the mad/sad/glad game. He would say mad or sad or glad. Then I would act out the feeling. If he said sad, I would make a very sad face and act like I was crying. I would say, "Oh, I feel so sad." Then he would name another feeling and I would act it out with all the exaggerated drama I could muster. Then we would switch – I would name the feeling and he would act it out. We only used those three. It was simple and he liked words that rhymed. He loved the game and we would play it over and over. I hoped that he would learn about his own feelings. I hoped that he would develop empathy for other people. It’s a new month and we’re moving on to Step 4 – Feel your feelings. 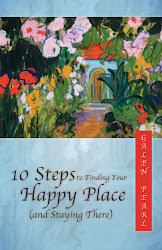 What does feeling our feelings have to do with finding our happy place? Well, as the former queen of denial, I can tell you from experience that denying some feelings results in denying all feelings. And feelings will not be denied forever. They will find a way to manifest – in other feelings, in behaviors, in our minds, in our bodies. You have to admire them for their tenacity and confidence. Feelings are the best model we have of self-esteem. They demand respect. When I lived in Thailand, I was impressed by how many words for feelings the Thai language offers. There are gradations and shades and nuances that are not available in English. Because language is so connected to our perception of ourselves and our world, it seems to me that the Thai people are much more self-aware of feelings in themselves and others. They know their feelings much better than we English speakers do. Does that make them happier? Eric Weiner thinks so. I just read his book The Geography of Bliss, in which he recounts his search for the happiest places in the world, including Thailand, known as the land of smiles. Along with many words for feelings, the Thais also have many words in their language for different kinds of smiles. Interesting, don’t you think? So let’s see what we can learn about our feelings this month. Let’s start by becoming acquainted with them. Some of us go through our lives without giving much attention to our feelings. Most of the time, we don’t even know what we’re feeling. This was a challenge for me at an earlier time in my life. When I was in therapy, my therapist was a real stickler for feelings awareness. I would often start a sentence by saying, “I feel like....” She would stop me right there, and encourage me to identify an actual feeling. For example, if I said I felt “like” bolting right out of her office, she would encourage me to say instead that I felt angry or afraid or sad or confused or (fill in the blank). Sometimes I pause and do a quick feeling inventory. What am I feeling right now? No judgment or analysis – just a neutral observation. No, maybe more positive than neutral. Just a quick howdy. Irritation, what’s up? Contentment, nice to see you. Anger, roaring like a lion, I see. Excitement, what fun. Sadness, let’s sit down. Once we become acquainted with our feelings, then we can get to know them better and improve our relationship with them through good habits. But shaking hands is a good start. With a smile. After I quoted the entire Serenity Prayer recently, a commenter observed that the overtly Christian language in the latter part of the prayer would be off-putting to “nonbelievers.” I felt sad when I read this because the sentiment behind the prayer is lovely, at least to me, and has value beyond the limiting vocabulary of a particular faith. Recently a minister in Florida burned a Koran as a statement of judgment against Islam. That, in turn, sparked retaliatory protests and killings in Afghanistan. All because we separate ourselves with different labels, different names for what we hold sacred. This is just my opinion, of course, but I don’t think the universal essence, for obvious lack of better words, is so easily described, explained, or contained. I read in Wayne Dyer’s book Inspiration about an ancient Hindu saying that “the name of God is truth.” Truth, I think, is beyond labels. The Tao Te Ching says, “The way that can be told is not the eternal Way. The name that can be named is not the eternal name. The nameless is the beginning of heaven and earth. The named is the mother of ten thousand things.” Perhaps the labels are the mother of ten thousand beliefs, each of which distinguishes us from them. It’s like speaking different languages. We can say the same thing in English, Arabic, and Chinese, but in each language, the meaning might be different because of different cultures, vocabulary, and syntax. As long as we need words to communicate, communication will be limited by those words. Communication with words will always be imperfect. We have the choice to see this imperfection as creating barriers, or we can see this imperfection as an invitation to look beyond the differences and transcend the barriers. For myself, my spiritual life is enriched and deepened by embracing truth as I find it, wherever I find it. When asked one time to identify three people who influenced my faith, I named three people who, I believe, were true people of God. One was the minister of my church. One was a Buddhist monk I met in Thailand. The third was the Muslim guard who watched over my home in West Africa. My faith community is Christian, and I have worshiped in Thai temples. I am an ordained Stephen Minister, and I am training as a Shambhala warrior. I follow Jesus, and the Noble Eightfold Path of Buddhism. I have lit incense at a Hindu shrine, and I smiled as my young son bowed to Allah alongside the Muslim guard he loved. My point is not to shock or alienate anyone, and I’m sorry if I have. My point is that I hope we don’t close our minds to beauty because of a label. I hope we don’t let language hold us back when we try to communicate about our deepest selves. If we speak our truth to one another with an open heart, and if we hold the words we hear with sacred respect, then we will surely meet in that place where there is no them, there is only us.